Ed, London: Office attire where I work is very casual – a lot of jeans and t-shirts, with only very senior people wearing suits. I’d like to incorporate some more formal or dressy items into my work attire but don’t want to stand out too much. What would you suggest? I’d start with ties and shoes. Retain the casual benchmark that is a pair of jeans, and try adding smarter shoes and/or knitted ties. Shoes with greater bulk or pattern are more casual. So go for brogues or wing-tips. The heavier look of patterned and layered leather shoes makes them sit more comfortably with heavy materials like flannel and denim. Suede is a lovely casual option but can be hard to maintain. Make your second or third pair of smart shoes a brown or ginger leather. That way you always have an alternative if it looks a bit wet out (don’t wear suede in the rain if you can help it). Go for brown. Whether chocolate, tan or blond, brown shoes will go best with jeans. Black makes you look like a schoolboy and other colours can be hard to wear effectively. (My only exception is red leather, which I think can look great with indigo denim.) Broadly speaking, the darker the brown the darker the jeans should be. But there is much greater flexibility here than with suits. Get a good-quality leather belt in a similar hue to wear with your shoes. Again, there is greater flexibility than with suits as to matching the shoes to the belt. But try and find something similar (two browns should be sufficient for all shades of shoe). Next, ties. Wear a well-fitting shirt with the jeans (all important considering that there will likely be no jacket to cover the shirt). It should fit well both at the waist and at the neck – nothing would remove this outfit’s crispness more than an undone shirt collar. For ties, anything is good apart from regular silk. Wool works well, as the duller texture suits the trousers and shoes more than silk – which complements polished shoes and worsted wool far better. Particularly good are the narrower, square-ended wool ties. In that same vein, knitted silk can also work well. It has a shinier hue but the texture makes it inherently more casual. Also cottons or cotton/silk mixes. This gives you two fantastic areas of menswear to plunder. It should go without saying that the jeans should be traditional and straight cut. No drainpipes or flares please. You can follow the discussion on Reader question: Office casual, part 1 by entering your email address in the box below. You will then receive an email every time a new comment is added. These will also contain a link to a page where you can stop the alerts, and remove all of your related data from the site. Ties without jackets are fail. 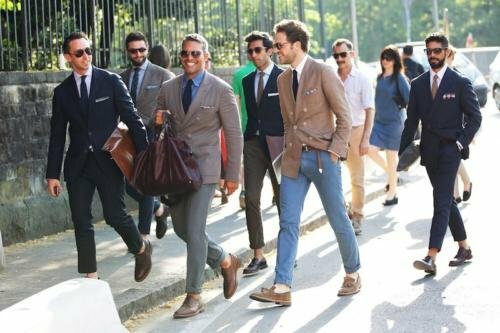 Go upscale in this order: shoes, shirts, pants, jackets, ties, suits. Personally, I don’t think ties are the best way to dress a bit more formaly without standing out. To many people they are the epitome of formal attire, and they can look somewhat affected in such a casual scenario due to the fact that they have no necessary function. I would agree with Jared’s order of shoe, shirt, pants, jackets, ties, and suits, as a general rule of ascending formality, though I find kaki’s to be pretty informal (i’d put them around shoes and shirt). I disagree. Like everything as far as style is concerned, I think the jacketless tie look can work well, depending on the person and the place. Some guys make it look quite nice, in my opinion. I do agree that the tie can look a little affected and lacks a legitimate purpose, but really, do ties ever actually have a purpose in modern dress? Although the splash of color in between the lapels of a suit looks nice, many men have demonstrated that it certainly isn’t necessary, unless you’re wearing a detachable collar (and I don’t think Ed is going to venture into that territory). What about the pocket square? I’m not going to blow my nose on it, nor am I going to use it to wipe my hands. It just looks nice. The tie is essentially the same. It just looks nice. I think many on this forum would agree that fine tailoring is something of an art, with an extremely high level of craftsmanship. Many would also probably agree that this art is worth preserving. Just as the lay person must be willing to develop an eye for great painting or an ear for classical music, they must be willing to learn to appreciate the things discussed here. “Business casual” isn’t going anywhere and fine tailoring will continue to be affected. To help it survive, I think people should be allowed to learn to appreciate it at their own pace and level of interest. As such, if a man in a business casual environment is interested in trying out some ties, with or without jacket, I think that’s wonderful for him. He’ll be learning about the splash of color, dose of personality and bit of luxury that a tie affords. Conversely, he’ll even better appreciate the relative merits of not wearing a tie. When his interest merits, he’ll move on to jackets and maybe suits. I think Ed should try out the look that Simon suggested and see if it works for him. I am certainly not arguing that ties are bad or that anyone should not be allowed to be creative in their dressing, I am merely suggesting that a tie would likely not be something that wouldn’t “stand out too much” against a backdrop of jeans and t-shirts. Clinton, Matt, thanks for your thoughts. Neither of you have mentioned the material of the tie, which is crucial. Silk will look out of place. Wool or other knitted mixes will not, particularly if they are slim varieties – as the traditional English woolen tie is, with a squared end. I think Ed will find that this makes all the difference. Matt is right. The jacketless tie look can indeed work well, and does so when a long-sleeved shirt and flat-front, plain-bottomed belted trousers are worn. Personally I’m more in the Matt camp here. Much like the bizarre surge in popularity of waistocasts, worn, to my eye, frequently with almost complete disregard for their traditional place in the wardrobe/ensemble, ties + casual are, much more often than not, a very risky, hard to pull off addition to an outift. Sure, the odd person might look decent, and I agree with S. that the material is important, but for every 1 person who manages to pull this off, I’d wager there are 20 who either look ridiculously affected or sloppily confused in their mixture of sartorial register. I run into a problem when trying to use the advice though. I’m late 20s but look young for my age. Dressing up often seems to accentuate the effect. I think it may be because it triggers the schoolboy look, especially mid-grey and navy blazers. Do you have any suggestions on good directions for someone who looks young? Thanks. What jackets do you think might work best? I think I’d stand out more wearing a tie than a jacket, but maybe it’s best to avoid both in favour of shoes/jumpers/chinos. So glad you think ties are desirable. The tieless-but-jacketed look always looks sloppy and unfinished to me.